Home Sewing What is a Birdnest? 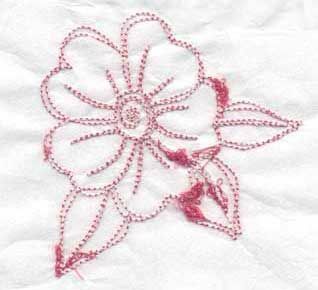 The term birdnest is commonly used to refer to the wad of needle thread that forms on the underside of the embroidery. A friend of mine calls it “thread vomit” and that’s a pretty accurate description. If the machine is not stopped in time, this thread cluster can ruin the garment by pulling it partially through the needle hole in the throat plate. If that happens, then it will prevent the item form sliding freely as the pantograph moves. And when this happens, the garment can pop out of the hoop leaving an unhooped, partially embroidered item. And it is probably trapped in the throat plate to the point that it may need to be cut to be liberated. Avoiding birdnests and the problems they cause is a very good reason to monitor your embroidery and not leave it to sew by itself. And the faster your machine sews, the faster an item can be damaged beyond repair. By listening to your machine, you will be clued in to any potential problems by an uncharacteristic sound. Until you learn what your machine is trying to tell you, you should stop the machine and investigate the cause. If your machine stops for no apparent reason, you should check into the cause before simply restarting the machine. What should you look for? 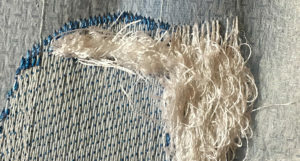 Look to see if thread is shredding and that the thread is properly threaded through the machine. Gently lift the hoop slightly and take peek under the sewing area to make sure there is no excess buildup of needle thread collecting there. Make sure no fabric is gathering in the needle hole. If you are attentive, you can stop the machine before too much unrecoverable damage is done. If you are lucky, you will only have to cut away a large blob of thread. However, there are several hazards involved in freeing your garment without further damage to it or your machine. The first step is to free the garment without cutting a hole in it or further loosening its tension in the hoop. Machines with drop-in bobbins present greater difficulties than those with front-loading bobbin cases. With front-loading bobbin systems, you can often cut the bobbin thread and remove it to allow access to the underside of the embroidery. If the birdnest is in the early stages, simple removing the bobbin case can release the thread wad. If the “tumor” is more advanced, you have a better chance of salvaging your garment by working from the lower thread path in the bobbin area, using an X-Acto knife or a surgical blade seam ripper. Take a deep breath and gather your patience then begin carefully cutting the thread without cutting your garment. For top loading bobbins, you will need to slide a long, flat blade, such as a sharp steak knife (or longer knife if the hoop is large), under the hoop and try to cut away the birdnest. In either case, take precautions not to cut the fabric or nick or scratch the throat plate, rotary hook, or other machine parts. When the garment is cut free, remove the hoop from the machine to clear out the rest of the birdnest from the machine and the back of the embroidery. If you were able to recover from the birdnest without unhooping your garment, cutting a hole, or distorting the tension, you can finish the design. But before reinserting your hoop, identify and correct the cause of the birdnest and make sure all thread pieces are cleaned out the of the machine. In the next post, we’ll look at common causes of birdnests, how to avoid them and how to repair damage from a birdnest.